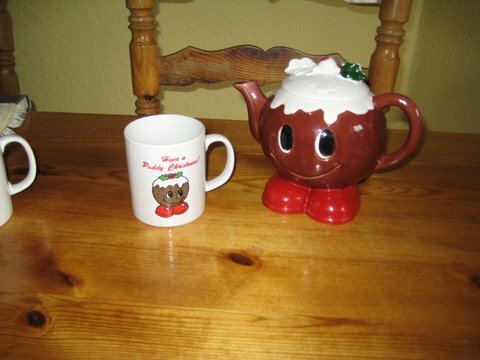 There is a little Puddy Pot, he is so very clever, he’s always warm and welcoming, come wind, hail or shower ! This was a Christmas present to my Aunt & Uncle about 15 years ago – you would never know they are tea jenny’s ! He may not be a brilliant pourer but he is always cheerful and great fun to see. This year he was belatedly added to the table for his annual outing. So here he is in all his splendor. Enjoy your cuppa !